Thousands of Malaysians, including history buffs, students of Sikhism and members of the Sikh community came in droves to see relics dating back to the days of the founder of the Sikh religion, Guru Nanak, more than 500 years ago. The relics, an earthenware water pot and a shenna, a milk bowl made of brass, both used by Guru Nanak, were until yesterday displayed at the Sikh Sight and Sound Museum housed at the Gurdwara Sahib in Sentul, Kuala Lumpur, which opened last month. The relics were brought to Malaysia by Prof Nirmal Singh Randhawa, 52, who came to attend the opening of the museum, the first of its kind outside India. The well-known academic is the 10th generation decendant of Baba Buddha Sahib, a venerated figure from the early history of Sikhism. “I will be taking the relics to several Sikh temples in Malaysia before moving to Singapore and then to New Zealand, where I have a Sikh martial arts centre,” Nirmal said. 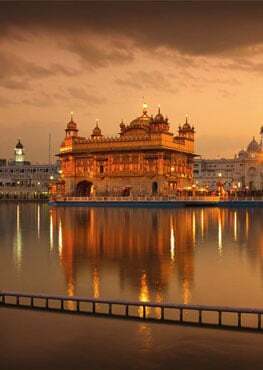 The two relics, he said have been handed down from one generation to another without a break from the time of Baba Buddha, who was born in 1506 in the village of Katthu Nangal, 18km northeast of the Amritsar, which is also the site of Sikhism’s holiest site, the Golden Temple. Nirmal said as a boy, his ancestor, Baba Buddha, was grazing cattle in his village when Guru Nanak happened to pass by. The boy ran back to his house and brought a bowl (shenna) of milk for Guru Nanak. The sage drank from it and blessed the boy. Since then, the shenna has been considered a sacred relic. The relics will be transported to Perak today where they will be on display at the Pusing Sikh temple. And on Wednesday, it will be displayed in Tanjung Tualang and finally in Ipoh on Thursday. Though relics from the Sikh religion are found in many temples, the bulk of them are housed at the Central Sikh Museum in India. Over the years, several such relics have emerged at auction houses and at black market sales, with some being sold to individuals outside the community. Last year, premier auction house Sotheby withdrew a rare 18th century steel armour plate from public sale after Indian protesters claimed it was a religious relic that may have been owned by one of Sikhism’s holiest figures, Guru Gobind Singh. The auction house then offered the artifact, which had been tagged at £12,000 (RM61,592) in London, to a member of the Sikh community under a privately-arranged deal.